DOGGIE SPLASHTOWN, SKATE LIKE A GIRL, PIRATE YOGA AND MORE! It is just four days until Ballard SeafoodFest 2018 kicks off the summer! This year's festival is filled to the brim with exciting interactive events and activities for all ages and species. Ballard SeafoodFest is kid-friendly and fido-friendly - we accept all well behaved children and pets in almost every area of the festival. Last year, we had to not allow dogs in the beer garden due to some naughty puppies. Bad dog! But this year since we really love fur babies, we are welcoming all leashed and well-mannered dogs into the beer garden. This area is 21 and older only. We are expecting great summer weather with temperatures in the 80s throughout the festival weekend. After you quench your thirst with a beverage from one of our amazing craft brewers or distillers, you can bring your four-legged friend to Doggie SplashTown on Saturday to cool off and enjoy some fun at Game Plank. Game Plank will fill Ballard Avenue (just south of the Gravity Payments MainStage) with fun all ages activities and exhibits. What's in store: Miss Homestreet Seafair hydroplane on display, aerial performances by the talented folks from Arcadia Seattle, giant Jenga, corn hole, ladder balls, bucket ball, Verity Credit Union Badminton Station, AstroTurf chill-out lounge, and the Doggie SplashTown with shaded pools, giveaways from All the Best Petcare . On Sunday, the area will be dedicated to the beloved Sunday Ballard Farmers Market with all the usual favorites and fun. New this year, we are offering Penn Cove steamed mussels in a butter wine broth and barbecued oysters in addition to the Trident Seafoods king crab legs. We will be selling tokens for the aforementioned seafood and salmon barbecue at the information booth and now in the Beer + Cocktail Garden for your convenience. Be sure to purchase your tokens early as these items are available while supplies last. Ahoy lil mateys! 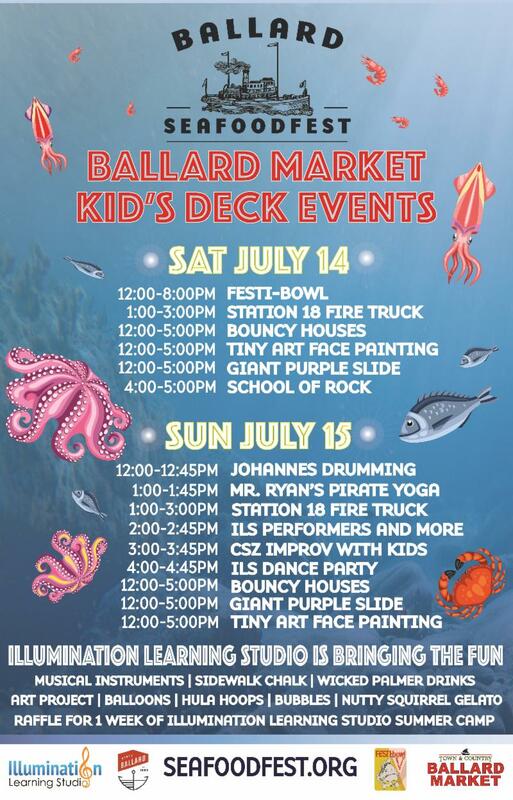 We will keep the whole family entertained at the Ballard Market Kid's Deck all SeafoodFest weekend long. Our fabulously fun friends at Illumination Learning Studios have amped up the events and activities with oodles of bubbles, face painting, musical instruments, art projects, pirate yoga, bouncy houses, hula hoops, sidewalk chalk and more! On Saturday, July 14 we will be shredding in the Ballard Commons Skate Bowl for Festi-bowl V. Festi-bowl, in its fifth year, is the largest all-ages skateboarding competition in Seattle. Hosted by Skate Like a Girl this event draws skateboarding enthusiasts of all ages and all ability levels. Cash prizes will be awarded in different divisions, clinics and live performances and award ceremonies will happen on the Kid's Deck stage throughout the day. This year's Festi-bowl will also pay a special tribute to Grindline Skateparks founder Mark Hubbard. A little bit of lutefisk goes a long way but 10 lucky contestants will be extreme lutefisking at our Ozzie's International Lutefisk Eating Competition at 4 p.m. on Sunday, July 15th. There are still a few spots available and you may sign up online. Come celebrate this Scandinavian delight with us and cheer on our brave contestants in town square (corner of Market and 22nd in front of Bergen Place Park). Party like it is 1989 with our Friday night concert with #All4Doras and Nite Wave. Last year, we witnessed people dancing and singing a block away from the MainStage so come and close the streets with us this year and kick off the SeafoodFest weekend! We will have our full Beer + Cocktail Garden lineup available. The food trucks: Nosh, Off the Rez, Paella House and Where Ya Matt will be our food offerings on Friday night. And, of course, all the surrounding local restaurants will be serving their delicious dishes. Don't forget to stop in and check out the specials and treasures many of our Ballard merchants have in their stores throughout the weekend. We would not be able to produce this festival every year if it weren't for their support and involvement so say hello and shop local - shop Ballard! We hope you have reserved a spot in your upcoming weekend for Ballard SeafoodFest 2018. To learn more go to www.seafoodfest.org . RESTYLE FOR RYTHER SUMMER SALETHE ENTIRE MONTH OF JULY! ReStyle Shop for Ryther allows you to shop for awesome second-hand gently-used items from donors with really great tastes and all the proceeds go toward a great cause. The store is filled with treasures for your wardrobe and home. The entire month of July, Re-style is offering 50% off everything (except jewelry), in the store! The ReStyle for Ryther shop is located at 5435 Ballard Ave NW, Seattle, WA 98107 tucked in between the Sunset Tavern and the Ballard Smoke Shop. Populuxe Brewing deserves a big CONGRATULATIONS for winning Best Small Brewery Awards by Washington Beer Awards! In addition to this prestigious title they won gold for fruit beer with their Raspberry Wheat, gold for historic beers for their maltøl and silver for Bring that Wheat Back NW Hef. Be sure to stop by the Beer + Cocktail Garden this weekend at SeafoodFest to see what Populuxe Brewing has crafted for the festival this year! Join the Ballard Food Bank for a sweet treat to cool off your summer. Bring your family or neighbors to Seattle Empty Bowls Ice Cream Social tomorrow! Submit your registration online to participate as a contestant. The only criteria is that you register online ($10 fee to sign up), be available to attend the competition on Sunday, July 15th at 3 p.m. and willingly consume up to 2 pounds of delicious lutefisk in a short amount of time.